Christian Copts, who make up about a tenth of Egypt’s population of 83 million, started a churchwide three-day fast today, Monday, as part of a protracted process to elect the 118th pope of The Christian Coptic Orthodox Church of Egypt. The new pope to succeed the late Pope Shenouda III, the 117th Pope of Alexandria and Patriarch of All Africa on the holy Apostolic See of Saint Mark, will be chosen on December 2. The papal selection countdown started September 12, when the Nomination Committee chaired by Bishop Pachomius, the acting pope, released a list of 17 nominees consisting of seven bishops and ten monks. An appeal period in which the nominations could be challenged ended yesterday, September 30. Come the end of the three-day fast next Wednesday, October 3, the Nomination Committee will meet in one of the monasteries to pare down the list of 17 nominees to create a shortlist of between five and seven candidates for papal election. 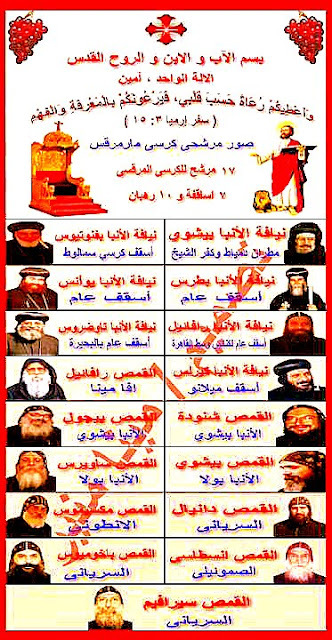 The Nomination Committee would then forward the five-to-seven names to a 2,410-member Election Committee consisting of metropolitan bishops, heads of monasteries and their deputies and treasurers, 12 priests from Cairo as well as judges, lawyers and members of parliament. Members of the electoral college must be older than 35 years and have a university degree, whether living in Egypt or abroad. Another churchwide three-day fast ending November 21 will precede the Election Committee’s November 24 vote for three papal finalists. A concluding churchwide three-day fast starting November 26 will pave the way for December 2, when on the altar during Mass at the Grand Cathedral of St Mark, from a sealed box with the names of the three highest vote getters written on slips of paper, a blindfolded young boy, selected at random from the congregation, would ultimately pick the next Coptic Pope. Metropolitan Bishoy: Of Damiette, Kafr el-Sheikh, Barary and the Monastery of Demian. Born in 1942, Bishoy studied engineering before joining the monastic order. Ordained bishop in 1972, he was elevated to the rank of Metropolitan in 1990. Bishop Youannes: Former secretary of the late Pope Shenouda III in charge of social services. A former medical student at the University of Assiut, he was ordained bishop in June 1993. Bishop Raphael: Auxiliary Bishop of Central Cairo and Heliopolis as well a former aide to late Pope Shenouda III and member of the Holy Synod. Born in Cairo in 1954 and a graduate of Ain Shams University's medical faculty, Raphael was ordained bishop in June 1997. Bishop Bevnotious of Samalout: A medical graduate born in Cairo in 1948 and member of the Holy Synod, he was ordained bishop in June 1976. Bishop Boutros: General Bishop and personal secretary of the late Pope Shenouda III. Bishop Tawadros: General Bishop of el-Behaira. Bishop Kyrollos (Cyril): Born in 1952 in Sohag governorate and a former engineering graduate, he was ordained in June 1986 before becoming Bishop of Milan in June 1996. Father Rafael Ava Mina: A monk at the monastery of Mar Mina in Alexandria, he was born in 1942 in Cairo and graduated in law from the University of Ain Shams. Father Maximos El-Antony: Born in Alexandria in 1954, he serves at the monastery of St. Anthony in the Red Sea governorate. Holding a degree in agriculture, he also has a diploma in icon restoration from the University of Moscow as well as one in museum administration from the United States. Father Shenouda Ava Bishoy: Born in 1943 in Minya, he holds a degree in religious studies. Father Pachomious El-Souriani: A monk at the monastery of Virgin Mary in Wadi Natrun. Born in Aswan in 1963, he holds a joint-degree in sciences and education. Father Daniel El-Souriani: Also at the monastery of Virgin Mary, he was born in Qena governorate in 1962 and holds degrees in sciences, education and Coptic studies from the University of Lyon. Father Anastasi El-Samuely: From the Monastery of St Samuel the Confessor in Minya. Born in 1939, he holds a degree in commerce. Father Bishoy Ava Paula: A monk at the monastery of St. Paul in the Red Sea governorate, he was born in 1964 in Mansoura. He holds a degree in agriculture from the University of Alexandria. Father Sawaris St. Paul: Born in Sharqiya governorate in 1959, he holds a degree in religious studies. Father Seraphim El-Souriani: Born in Cairo in 1959, he holds a sciences degree from the University of Ain Shams. Father Pigol Ava Bishoy: From the Monastery of St. Bishoy in Wadi Natrun. He was born in 1951 and holds a degree in mechanical engineering. Among the seven bishop contenders, Metropolitan Bishoy, Bishop Youannes and Bishop Raphael seem to stand out, albeit for totally different reasons.